Asset recovery specialist Barnaby Hone provides an insight into how best to train lawyers and financial investigators on effective case management and strategy in International Asset Recovery matters. Barnaby recently completed 16 months seconded to the CPS Proceeds of Crime Unit in the Caribbean, dealing with asset recovery matters of all types. Whilst there he provided many training and mentoring courses. 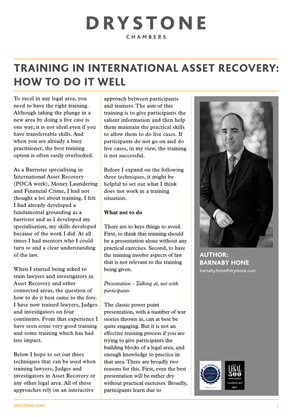 The following article is a result of his experience in multi-jurisdictional asset recovery matters and outlines how best to help others in training courses aimed at this area. He explains the need for practical-based scenario training against the traditional powerpoint presentation and how useful post-training mentoring can be to ensure delegates gain the most from their training.